We have a extensive inventory of Klein Side Cutting Pliers. Klein Tools 12098 8" Universal Side-Cutting Pliers - Connector Crimping Klein Tools, Inc. represents much more than Klein pliers. The company's product line has broadened to include virtually every major type of hand tool used in construction, electronics, mining, and general industry in addition to the electrical and telecommunications fields. Klein Tools..
Klein Tools 12098-INS Insulated Universal Side-Cutting Pliers - Connector Crimping Klein Tools, Inc. represents much more than Klein pliers. The company's product line has broadened to include virtually every major type of hand tool used in construction, electronics, mining, and general industry in addition to the electrical and telecommunications fields. Klein.. Product Description: Klein Tools transformed the look of its most popular 2000 Series® Side-Cutting Pliers with an exclusive plastic-dipped camouflage handle design and a distinct black-oxide plier head with a special laser-etched "Support Our Troops" logo. These pliers are fully functional with all the features and benefits professional tradespeople have come to expect from Klein. These limited ..
Klein D213-9NE-INS Specifications: Handle Color: orange Handle Finish : insulated Jaw Length : 1-19/32" Jaw Thickness: 5/8" Jaw Width : 1-5/16" Knife Length: 25/32" Nose Type:New England Overall Length: 9-5/8" Klein D213-9NE-INS Features: &..
Klein Tools 201-7CST Ironworker's Work Pliers Klein Tools, Inc. represents much more than Klein pliers. The company's product line has broadened to include virtually every major type of hand tool used in construction, electronics, mining, and general industry in addition to the electrical and telecommunications fields. Klein Tools 201-7CST Ironworker's .. Features: Hinge opening holds and cleans 5/8" pole line and hardware bolts or threaded rods. High-leverage design. Rivet is closer to the cutting edge for 46% greater cutting and gripping power than other plier designs. Streamlined design with rounded nose and sure-gripping, cross-hatched knurled jaws. Handle Color: light red Handle Finish: heavy-duty, oversized, .. Features: Custom, US-made tool steel. Hot-riveted joint ensures smooth action and no handle wobble. Induction hardened cutting knives for long life. Unique handle tempering helps absorb the "snap" when cutting wire. 2000 Series pliers available. Cuts ACSR, screws, nails and most hardened wire. "Handform" handles for full gripping and cutting power. Precision-hardened plier head for .. Features Custom, US-made tool steel. Hot-riveted joint ensures smooth action and no handle wobble. Induction hardened cutting knives for long life. Unique handle tempering helps absorb the "snap" when cutting wire. 2000 Series pliers available. Cuts ACSR, screws, nails and most hardened wire. "Handform" handles for full grippin.. Description: Klein D2000-9ST 9-Inch Ironworker's Work Pliers-High-Leverage. The Klein D2000-9ST 9-Inch Ironworker's Work Pliers-High-Leverage twists and cuts soft annealed rebar tie wire. The Klein D2000-9ST 9-Inch Ironworker's Work Pliers-High-Leverage features the high-leverage design where the rivet is closer to the cutting edge for 46-Percent greater cutting and gripping power ..
Sure-gripping, cross-hatched knurled jaws Cuts ACSR, screws, nails and most hardened wire; Features combination polished and black-oxide finish Custom US-made tool steel Heavy-duty cutting knives 2000 Series 6" .. Features: Custom, US-made tool steel. Hot-riveted joint ensures smooth action and no handle wobble. Induction hardened cutting knives for long life. Unique handle tempering helps absorb the "snap" when cutting wire. 2000 Series pliers available. Cuts ACSR, screws, nails and most hardened wire. "Handform" handles for full gripping and cutting pow..
Sure-gripping, cross-hatched knurled jaws Cuts ACSR, screws, nails and most hardened wire; Features combination polished and black-oxide finish Custom US-made tool steel Heavy-duty cutting knives 2000 Series Klein D201-7NE Specifications: Handle Color: Dark Blue Handle Finish: plastic-dipped Jaw Length: 1-9/32" .. Custom, US-made tool steel. Hot-riveted joint ensures smooth action and no handle wobble. Induction hardened cutting knives for long life. Unique handle tempering helps absorb the "snap" when cutting wire. 2000 Series pliers available. Cuts ACSR, screws, nails and most hardened wire. 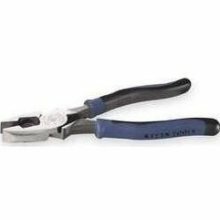 "Handform" handles for full gr..
Klein D213-9 High-Leverage Side-Cutting Pliers 9"
The high-leverage design of these Klein Tools 9 in. Side-Cutting Pliers provides increased cutting strength while cross-hatched knurled jaws allow for a steady grip. Steel alloy is forged, precision machined, hardened and tempered High-leverage design increases cutting power Sure-grip, cross-hatched knurled jaws Hot-riveted joint ensures smooth action and no ha..
Quickly and easily pulls 1/8" or 1/4" flat steel fish tape without damaging the tape High-leverage design Rivet is closer to the cutting edge for 46% greater cutting and gripping power than other pliers design Streamlined design with sure-gripping, cross-hatched knurled jaws Heavy-duty cutting knives cuts ACSR, screws, nails, and most.. Description: Klein D213-9ST 9-Inch Ironworker's Work Pliers-High-Leverage. The Klein D213-9ST 9-Inch Ironworker's Work Pliers-High-Leverage twists and cuts soft annealed rebar tie wire. The Klein D213-9ST 9-Inch Ironworker's Work Pliers-High-Leverage features the high-leverage design where the rivet is closer to the cutting edge for 46-Percent greater cutting and gripping power than other pliers ..
Quickly and easily pulls 1/8" or 1/4" flat steel fish tape without damaging the tape Streamlined design with sure-gripping, cross-hatched knurled jaws Induction-hardened cutting knives for long life Hot-riveted joint ensures smooth action and no handle wobble High-leverage design Rivet is closer to the cutting edge for 46% greater cutting and gripping po.. Durable and reliable 9-inch side cutting pliers High-leverage design Plastic-dipped handles for added comfort New England nose type Limited lifetime warranty The Klein Tools 9-Inch High-Leverage Side Cutting Pliers feature a forged, hot-riveted, and heat-treated design that assures long lasting performance and accurate alignment. Blue plastic-dipped handles are fea..
Klein D2000-9NECR Specifications: Handle Color: royal blue Handle Finish: plastic-dipped Jaw Length: 1-19/32" Jaw Thickness: 5/8" (16) Jaw Width: 1-1/4" (32) Knife Length: 25/32" (20) Nose Type: New England Overall Length: 9-3/8" Klein D2000-9NECR Features: Crimpi..
Klein D2000-9NE Specifications: • Handle Color: royal blue • Handle Finish: plastic-dipped • Jaw Length: 1-19/32" • Jaw Thickness: 5/8" (16) • Jaw Width: 1-1/4" (32) • Knife Length: 25/32" (20) • Nose Type: New England • Overall ..
Klein D213-8NE Specifications: • Handle Color : dark blue • Handle Finish : plastic-dipped • Jaw Length: 1-7/16" • Jaw Thickness:5/8" • Jaw Width: 1-3/16" • Knife Length : 23/32" • Nose Type : New England • Overall Length: 8-11/16" Klein D213-8NE Features: • High-leverage design. Rivet is closer to th..
Klein D213-9NETH Specifications: • Handle Color: Dark Blue • Handle Finish: plastic-dipped • Jaw Length: 1-19/32" • Jaw Thickness: 5/8" • Jaw Width: 1-1/4" • Knife Length: 25/32" • Nose Type: New England • Overall Length: 9-3/8" Klein D213-9NETH Features: • Hinge opening holds and cleans 5/8" pole line and .. Features: • Built-in crimper works on non-insulated connectors, lugs, and terminals • Built-in channel pulls steel fish tape without damaging the tape • 2000 series heavy-duty cutting knives cut ACSR, screws, nails, and most hardened wire • Innovative dual material Journeyman grips are more comfortable and last longer than other handles Specifications: • Jaw Length: 1-19/32" ..
Klein J2000-9NETP Specifications: • Handle Color: light-blue/black • Handle Finish: Journeyman • Jaw Length: 1-19/32" • Jaw Thickness: 5/8" • Jaw Width: 1-1/4" • Knife Length: 25/32" • Nose Type: New England • Overall Length: 9-1/2" Klei..
Klein J2000-9NE Specifications: • Handle Color: light-blue/black • Handle Finish: Journeyman • Jaw Length: 1-19/32" • Jaw Thickness: 5/8" • Jaw Width: 1-1/4" • Knife Length: 25/32" • Nose Type: New England • Overall Length: 9-1/2" Klein J2000-9NE Features: • 2000 series cuts ACSR, screws, nails and mo..